Recently, I watch the HBO documentary on the legendary UCLA Dynasty where UCLA won ten NCAA basketball titles in twelve years between 1964 and 1975. Led by John Wooden, a legend amongst coaches in general pursued an unmatched focus on excellence and achieving a goal of winning the NCAA championship consistently. A few years ago, I had the chance to meet John Wooden and engage in a brief conversation with him. It was a treasure trove of imparted wisdom I will never forget. To this day, I marvel at his quietness yet the focus was clearly present at every moment. To pursue excellence in building top line revenue growth takes a high degree of focus. If an organizations hopes to accomplish a business level feat akin to UCLA’s basketball dynasty it will need to have a consistent focus on understanding the goals of its buyers. John Wooden established a disciplined process to impart among his players how to achieve this focus and accomplish many step-ladder goals towards the ultimate goal of winning the championship. What does this look like in a business context? 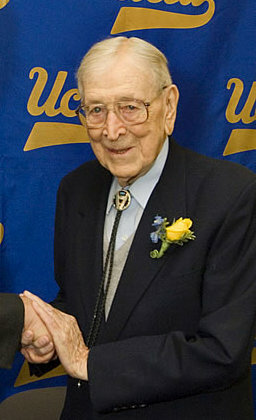 In John Wooden’s world, focus was a labyrinth of fundamentals and plays. There was a process where each season began with a concentrated focus on fundamental skills and a core set of plays. Organizations today in their pursuit to get more leads, grow more revenue, and close more deals can lose sight of the fundamental process of listening to customers and being attentive to nuance changes in their goals. Implementing and moving from one tactic to another in a search for the latest trick to create a spurt of growth. Consistency in listening to customers and determining their goals is the hallmark of excellence. Many organizations have a game plan for demand generation, lead nurturing, sales promotions, marketing tactics, and the likes. Many organizations surprisingly do not have a game plan for understanding and aligning with buyer goals. Buyer persona development, as I have made the case often recently, is not an exercise in profile building. Essentially, it is a consistent game plan for understanding buyer goals that creates a focus platform for customer strategy building. Developing a consistent flow of qualitative and experiential analysis that allows for deeply understanding goals requires a game plan. John Wooden never said “just play ball”. Likewise, companies need to elevate from saying “we need to listen to our customers” to having a game plan for understanding buyer goals deeply. Unprecedented at the time for the collegiate level, John Wooden gave his teams’ detailed playbooks on how to execute game plans. Enabling his teams to familiarize and immerse themselves in the plays. Thus, helping them to achieve that unparallel focus needed to win. To drive top line revenue growth, organizations must enable their teams with playbooks that not only inform them about buyer goals, via buyer personas and detailed depictions of relevant customer interactions in their areas, but also about the tactics and strategies designed to align with buyer goals. The buyer persona development process is very much about achieving an organizational transformation around the buyer and buyer goals. For the past 11 years, my colleague Angela Quail and I, through our firm Goal Centric, have been fortunate to work with several Fortune 100 companies who have this transformation underway in portions of their global businesses. These organizations helping to make Goal Centric the leading pioneer in buyer persona development with a body of work that dates back to over a decade. Each has started the transformation with the fundamental process of first listening to customers and having a focused pursuit to understand buyer goals to shape customer strategy. Several senior leaders we worked with embraced buyer persona development as a transformative process versus viewing the effort as a tactical profiling means. As a result, each built fundamentally sound and focused customer strategies that have withstood the test of time. Just as John Wooden’s legendary methods of enabling a focused pursuit of a goal has withstood the test of time.